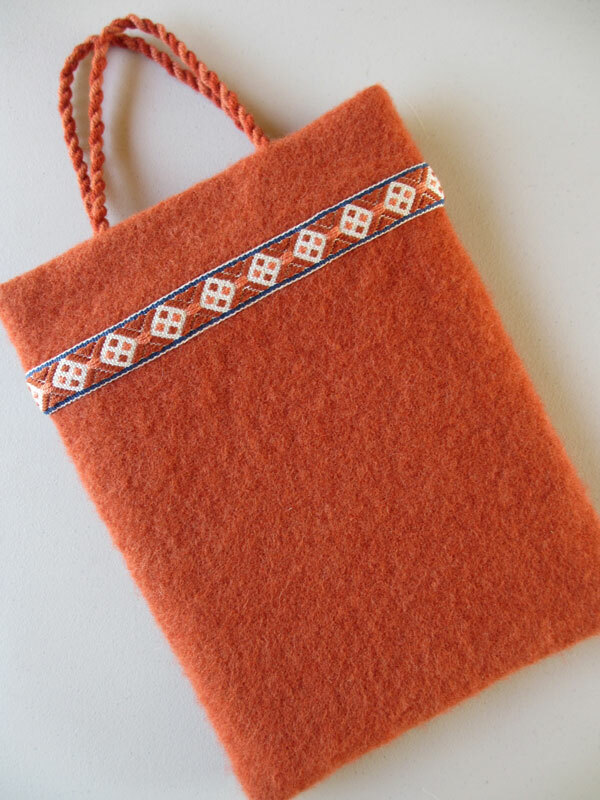 H ere I’ve used a pick-up band to trim a wool bag that I wove on a rigid heddle loom and then fulled (felted). The band does double duty—first by encasing the raw edge of the top of the bag, which was folded to the outside, and second by providing a decorative finish and focal point for the piece. This leaves the inside of the bag completely smooth, and there’s no need to add a lining. The bag is about 10″ wide and 13″ tall. I’ll use mine to hold a bandweaving project-in-process, or a boat shuttle and quills for my floor loom, but a handy bag like this has dozens of possible uses. Here’s how I made mine. 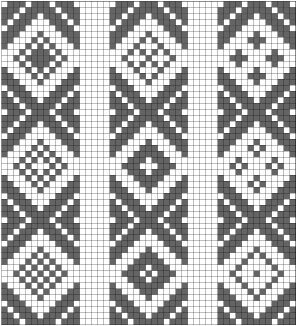 Structure: Mønsterband, Type 2 pick-up (2 background ends between pattern ends in the threading). 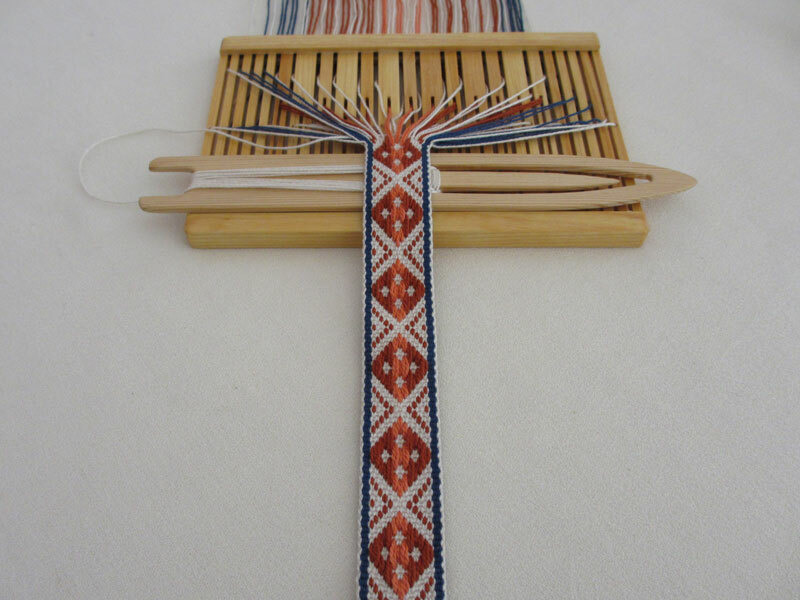 Equipment: Inkle loom or band heddle to accommodate 57 ends (if you prefer the “finger method” of making pick-ups and push-downs), or pattern heddle to accommodate 13 pattern ends and 10 border ends on each side (if you prefer making pattern selections with the pointed shuttle). 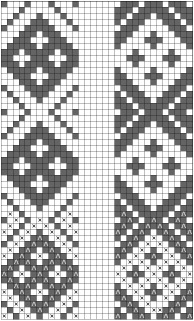 The pattern heddle is shown in the photo below. Supplies: Sewing thread to match background color. Warp yarn: Perle cotton 5/2 in four colors, background (I used UKI color Natural), main pattern (I used Webs color Burnt Sienna), accent pattern (I used UKI color Melon) and border (I used UKI color Cobalt Blue). Weft yarn: Same as warp (background color). Color order: See warp draft below. Picks per inch: About 14½ ppi measured at slack tension. Length: For this size bag you will need a band about 23-24″ long after wet finishing. From a long warp on my pattern heddle, I wove and cut off a 27″ length, which shrunk to 25″ after wet finishing. 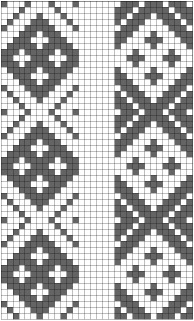 Weaving: See pattern charts below. I wove the pattern with the diamond side facing me, but used the reverse side for trimming the bag. Wet finishing: Hand wash in warm water and hang to dry, then lightly steam. For my band I used a simple hatched diamond (a common motif in Norwegian pick-up bandweaving). I like to weave this pattern with the diamond side up, but I used the reverse side of the band for trimming the bag. My patterns chart is shown below and I’ve included both sides of the band so you can work with whichever side you prefer. Below is another version of the chart, in which I’ve marked the first repeat with caret symbols (for pick-ups) and Xs (for push-downs), a system that is explained on pages 128-29 of the book. 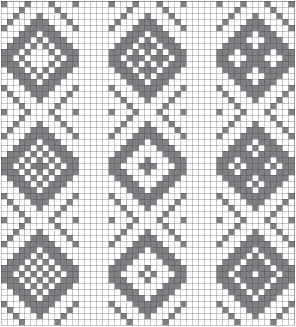 This can be helpful for beginning pick-up weavers, but experienced pick-up weavers don’t need the symbols—they have a visual understanding of the motif as a whole and can quickly glance at the fell line to see which ends need to be manipulated on each row. And weavers who are using the pattern heddle also don’t need the symbols, whether they are experienced or not, since the pattern heddle operates on a different system and such symbols would be a distraction. If you want to change the look of the diamond along the length of the band, here are some variations to try. And here is the same chart showing the reverse side. Yarn: I used Borgs Tuna, 100% wool, 6/2 weaving yarn, approx. 330 yards per 100 gram skein, in orange (#3444) for the warp and rust (#3765) for the weft, less than one skein of each (about 70 grams for the warp and 56 grams for the weft). Loom: I used a rigid heddle loom (13½″ Glimåkra Emilia) with a 10-dent heddle. Weaving: I hemstitched both ends and wove off the whole warp in balanced plain weave. I trimmed the ends, leaving about ½″ fringe in addition to the hemstitching. 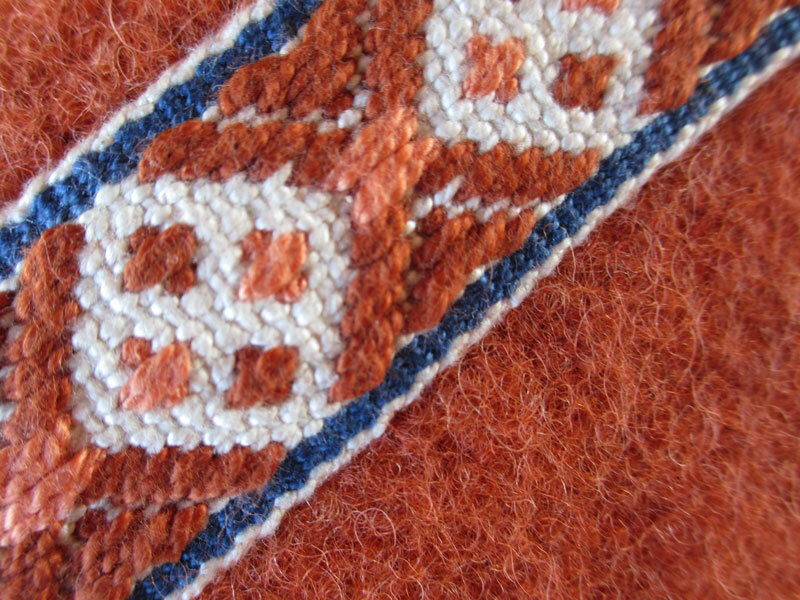 Dimensions: Off loom, the piece measured 12¾″ wide and 42½″ long between hemstitching. Finishing: I folded the flat piece in half and seamed the sides by loosely whipstitching with weft yarn, then I fulled it in the washing machine. Dimensions after finishing: After fulling, the bag measured 10″ wide by about 16″ to the hemstitching. I cut off the fringe and hemstitching, plus 5/8″ from the top of the bag, and folded down 2¾″ to the outside at the top, so that the bag then measured 10″ wide by 13″ tall. Handles: For each handle I cut 8 strands of warp yarn (bundle of orange) and 8 strands of weft yarn (bundle of rust) about 25″ long and used a fringe twister to twist the two bundles together. With a crochet hook I poked holes in the top fold of the bag about 4″ apart, pulled the ends of the cord through and knotted them so the handles have a drop of about 5″. Wonderful tutorials, Thank you, you explains so clearly. cant wait to try out some of these. You’re welcome! Glad to know you like this.